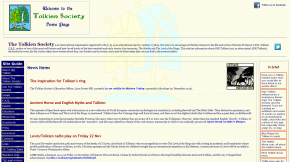 The Tolkien Society has launched its brand new website with a modern feel and clear design. The first redesign of the website for a decade, its vibrant appearance seeks to showcase everything about the Society and encourage as many people as possible to become members. New features of the website include: a blog, frequently-updated news, smials map, members’ area, events listings, and the long-overdue ability to join online. Last year, on his election to the post of Chairman of the Tolkien Society, Shaun Gunner stated that his key aim for his first year was to see the Society achieve a new website. The new design opens the Society up to more people around the world and represents a 21st Century Society looking forward to reaching out to new audiences. Full credit for creating the new website goes to Daniel Helen and Emil Johansson with the help of Andrew McMurry. But, the Society would not have had a website at all if it weren’t for Lester Simons in setting up a website in 1996 and Andrew Armstrong for maintaining it for the last 15 years.